It’s a pretty big year for Batman. The thousandth issue of Detective Comics came out this week, Batman himself turns 80-years-old, and, you know, he’s Batman. People kind of like him, you know? To commemorate the Dark Knight’s milestones, the people at LEGO have announced some brand new sets featuring the Caped Crusader, his closest allies, and his most nefarious villains. There are some great looking vehicles (love that Riddler copter with the bank vault), some iconic playsets, and an eclectic group of minifigures. Batman is a given, of course, but look at the other Batfamily characters and villains in the lineup: Commissioner Gordon, Robin, Joker, Catwoman, Riddler, Clayface (awwww yes), and… Captain Marverrrrrr Shazam? Right on. Emergency! Mr. Freeze™ is turning GOTHAM CITY™ into ice! 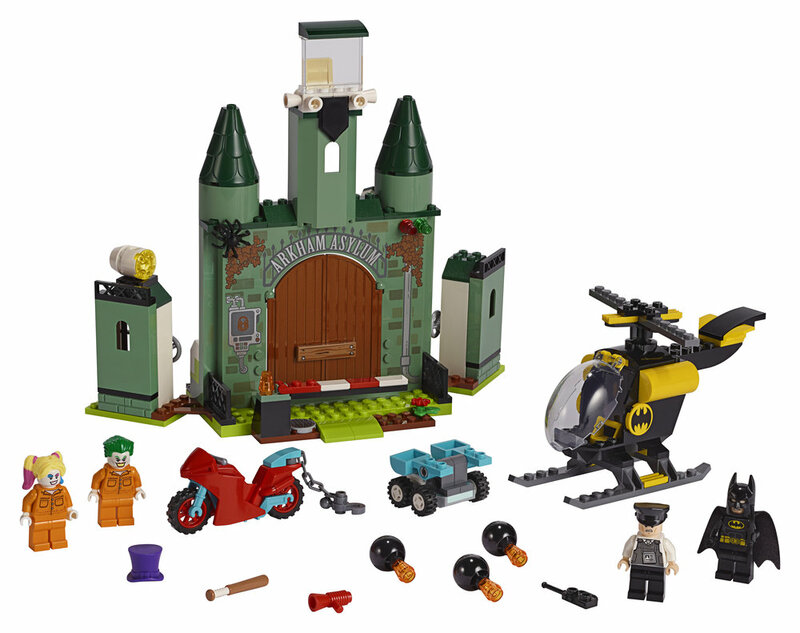 Ride to the rescue with LEGO® Batman™ and Robin™ on the Batcycle with this awesome playset. Fire the stud shooter at Mr. Freeze’s snow scooter and steer clear of his freeze gun. Then split the Batman bike in two and ambush the supervillain. Attack with Robin’s sword and target Mr. Freeze with Batman’s Batarang and grappling hook shooter. Only you can turn up the heat on this bad guy and save GOTHAM CITY! • This super-hero construction playset includes 3 LEGO® minifigures: Batman™, Robin™ and Mr. Freeze™. • Batcycle features a dual minifigure cockpit for Batman™ and Robin™, a stud shooter, Batman’s Batarang and grappling hook shooter, Robin’s sword, 2 non-shooting guns, 2 batwings and a split function to divide the vehicle into 2 separate bikes. • The Batarang, grappling hook shooter, sword and 2 guns can be detached from the Batcycle and held by minifigures for battle action. • Also includes a snow scooter with space for the Mr. Freeze™ minifigure. • Accessory elements include Mr. Freeze’s new-for-June-2019 helmet and backpack with an attached, non-shooting freeze gun, plus 10 assorted Action Pack elements to customize builds, minifigures and weapons. • All 3 minifigures in this LEGO® DC Batman™ toy playset are new for June 2019. • This cool kids’ toy makes the best super-hero birthday gift for Batman™ fans. • Use the LEGO® Life app to access the intuitive Instructions PLUS building instructions for this Batman™ playset. Help even younger builders through the building process, with easy-to-use zoom, rotate and ghost-mode functions to visualize their creations as they go. • Batcycle measures over 1” (5cm) high, 4” (11cm) long and 3” (8cm) wide. • Snow scooter measures over 2” (6cm) long, 1” (4cm) wide and under 1” (2cm) high. • This super-hero toy playset includes 2 new-for-June-2019 LEGO® minifigures: Batman™ and The Joker™. • Batmobile™ features an opening minifigure cockpit with detailed dashboard, 2 hidden, foldout stud shooters, opening hood with brick-built engine inside, automatic spinning flame exhaust element function, wheel trims with Bat symbol decoration, 2 batwings and translucent yellow and red light elements. • The flame exhaust element spins around when the car is moved along. 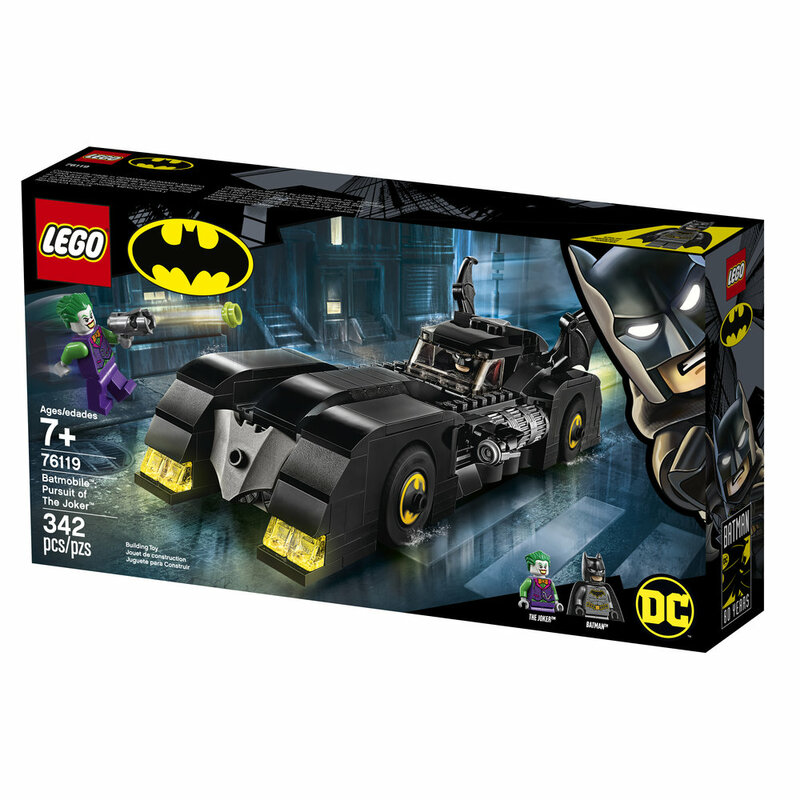 • This LEGO® Batman™ toy playset includes The Joker’s stud shooter and 10 assorted Bat elements to customize builds, minifigures and weapons. • This cool kids’ toy makes the best super-hero gift for Batman™ fans. • Use the LEGO® Life app to access the intuitive Instructions PLUS building instructions for this super-hero toy. Help even younger builders through the building process, with easy-to-use zoom, rotate and ghost-mode functions to visualize their creations as they go. • Batmobile™ toy car measures over 2” (7cm) high, 9” (24cm) long and 2” (6cm) wide. • This super-hero kids’ toy includes 4 new-for-June-2019 LEGO® minifigures: Batman™, Commissioner Gordon™, SHAZAM!™ and The Riddler™. • Batman’s Batwing features an opening minifigure cockpit, 2 new-for-June-2019 rapid-fire city shooters with tile ammo and 2 shooters which can fire tiles or studs. • Each city shooter can fire 3 tiles in quick succession. • Commissioner Gordon’s police car features a minifigure driver’s seat, removable roof for easy access and GOTHAM CITY™ police stickers. • The Riddler’s helicopter has an opening minifigure cockpit, spinning rotors, 2 flick missiles and a chain with a hook to pick up the safe. • Safe features a locking function and 2 gem and 2 $100 bill cash elements inside. • Turn the dial on the safe’s door to lock it. • This LEGO® Batman™ toy playset includes Batman’s Batarang and SHAZAM!’s 2 Power Bursts. • Accessory elements include The Riddler’s crowbar, plus 10 assorted Action Pack elements to customize builds, minifigures and weapons. • Batwing fits on the roof of the Batcave jail in LEGO® DC Batman™ 76122 Batcave Clayface™ Invasion playset. • This cool kids’ toy makes the best super-hero gift for Batman™ fans. • Batwing toy measures over 1” (5cm) high, 6” (17cm) long and 7” (19cm) wide. • Police car measures over 1” (4cm) high, 5” (14cm) long and 1” (5cm) wide. • Helicopter measures over 3” (8cm) high, 7” (20cm) long and 1” (4cm) wide. Quick! 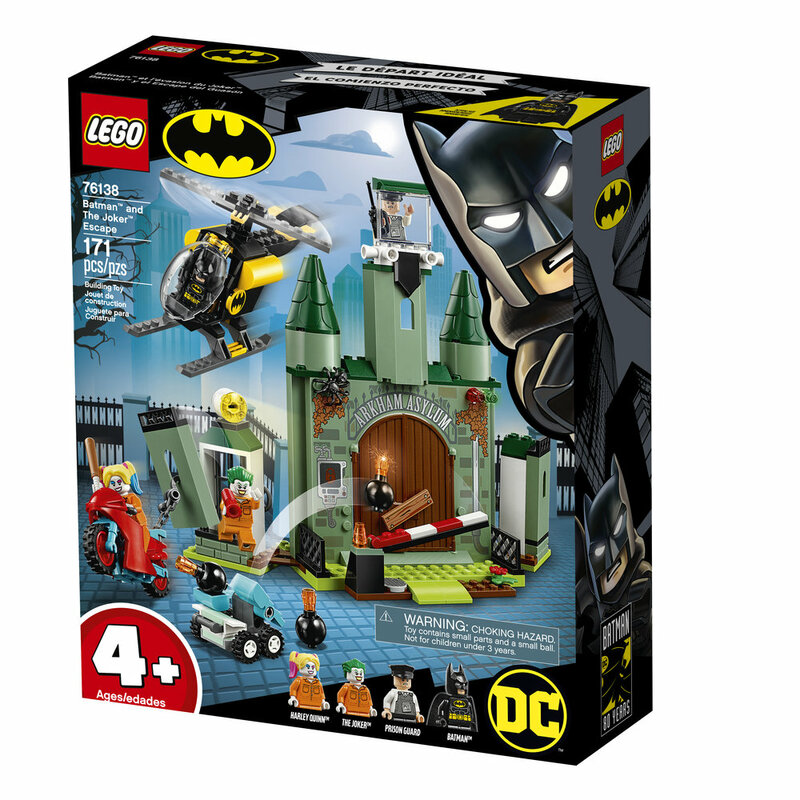 Transform Bruce Wayne™ into Batman™ to stop Clayface™ invading the LEGO® Batcave! Check the Batcomputer and dash to the Bat-Tank™. Fire the Bat-Tank’s flick missiles, hook and stud shooters at the monster. Team up with Batwoman™ to get Clayface to release Robin™ from its huge hands. But watch out—Two-Face™ is trying to break Catwoman™ out of the jail. You must capture these SuperVillain invaders before they destroy the Batcave! • This LEGO® Batman™ toy playset includes 6 minifigures: Batman, Bruce Wayne™, Robin™, Batwoman™, Catwoman™ and Two-Face™, plus a posable, Clayface™ big figure with snapping jaws and gripping hands that can hold a minifigure. • This set features the LEGO® Batcave toy with Batcomputer zone, hi-tech zone, workout zone, weapons room, trophy room and detachable transformation tower and jail modules, plus a BatTank™. • The Batcave’s Batcomputer zone features a desk, rotating minifigure chair and 5 computer screen elements with computer graphics stickers. • Hi-tech zone features a buildable backpack for the Batman™ minifigure with detachable building tools. • Trophy room has 3 podiums to display 3 iconic artifacts from the Batman™ universe—dinosaur statue, giant penny and The Joker™ card elements. • Transformation tower features a function to ‘transform’ Bruce Wayne™ into Batman™—place the Bruce Wayne minifigure on top next to the telephone element, the Batman™ minifigure inside, then pull the pin on the back to make Bruce disappear and Batman appear at the base of the tower. • Jail features an explode function to blow out the prison bars, plus a rooftop parking spot for the Batwing included in the 76120 Batman™ Batwing and The Riddler™ Heist playset. • Bat-Tank™ features an opening minifigure cockpit, rotating turret with 4 flick missiles, plus a detachable stud shooter and hook shooter. • This Batman™ toy playset includes Batman’s Batarang, Batwoman’s Batarang, Catwoman’s whip and Two-Face’s dynamite and non-shooting gun. • Accessory elements include 10 assorted Action Pack elements and 10 assorted Bat Family Pack elements to customize builds, minifigures and weapons. • Batman™, Bruce Wayne™, Robin™, Catwoman™ and Two-Face™ minifigures are new for June 2019. • This set includes over 1,037 pieces. • This cool kids’ toy makes the best birthday gift for Batman™ fans. • LEGO® Batcave toy including detachable prison and transformation tower modules measures over 8” (22cm) high, 16” (43cm) wide and 3” (9cm) deep. • Bat-Tank™ measures over 3” (8cm) high, 3” (8cm) long and 2” (7cm) wide. • Clayface™ stands over 4” (12cm) tall. • LEGO® 4+ toy building sets are specially designed to be fun and easy for youngsters and help to grow their confidence with simple building steps for the perfect start to LEGO brick building. • This LEGO® DC Batman™ playset includes 2 minifigures: Batman and The Riddler™. 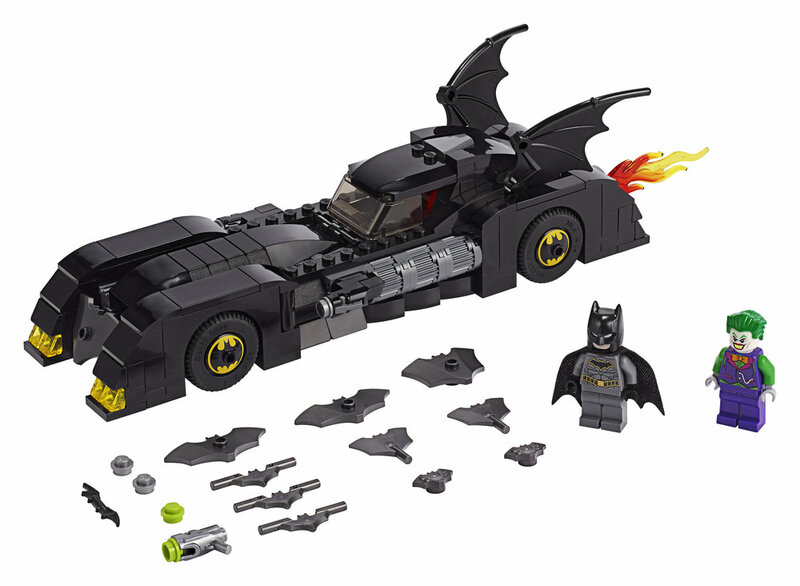 • The easy-to-build Batmobile™ toy car features a Starter Brick chassis, minifigure cockpit, 2 separate attachment points for Batman's Batarang, 2 batwings and a flame exhaust element. • Buildable ATM cash machine features an attachment point for The Riddler’s dynamite element. • Weapons include Batman’s Batarang and The Riddler’s dynamite. • Accessories includes The Riddler’s buildable skateboard and crowbar element. • The Riddler™ minifigure is new for June 2019. • LEGO® 4+ creative toys introduce your child to a wide universe of their movie favorites, TV characters and everyday heroes. • LEGO® 4+ building sets were previously known as LEGO Juniors and can be built together with all other original LEGO sets and LEGO bricks for creative building. • This super-hero toy makes the best birthday gift for preschoolers and youngsters who love Batman™. • Batmobile™ toy car measures over 1” (4cm) high, 5” (15cm) long and 1” (4cm) wide. • ATM measures over 1” (5cm) high, 1” (5cm) wide and 1” (3cm) deep. • LEGO® 4+ sets are specially designed to be fun and easy for youngsters and help to grow their confidence with simple building steps for the perfect start to LEGO brick building. • This super-hero toy includes 4 LEGO® minifigures: Batman™, Harley Quinn™, The Joker™ and a prison guard. • Arkham Asylum features an opening barrier, entrance doors with a removable crossbar lock, watchtower with a minifigure seat, 2 prison wings each with an opening jail cell for a minifigure, rotating buildable searchlight, TV screen element with image of The Joker™, buildable control panel with a detachable handcuffs element, plus 3 Batman villains’ possessions—buildable Scarecrow™ fear gas container and Mr. Freeze™ ray gun, plus Penguin’s hat element. • Batman’s helicopter features a Starter Brick chassis, opening minifigure cockpit and rotating rotors. • Harley Quinn’s bike features space for a minifigure plus a chain and hook to pull the mobile catapult or pull down the prison cell walls. • Mobile catapult has 2 launchers plus 3 buildable bombs. • This cool Batman™ toy playset includes Batman’s Batarang and megaphone element, and Harley Quinn’s baseball bat. • Harley Quinn™ and The Joker™ minifigures with prison outfit decoration are new for June 2019. • The best super-hero gift for preschoolers, LEGO® 4+ introduces your child to a wide universe of their movie favorites, TV characters and everyday heroes. • Use the LEGO® Life app to access the intuitive Instructions PLUS building instructions. Help even younger builders through the building process, with easy-to-use zoom, rotate and ghost-mode functions to visualize their creations as they go. • Arkham Asylum measures over 8” (21cm) high, 9” (23cm) wide and 3” (10cm) deep. • Batman™ helicopter toy measures over 3” (9cm) high, 5” (14cm) long and 1” (4cm) wide. The sets will be available in stores beginning August 1. Jan 4 LEGO announce a massive "Welcome to Apocalypseburg" set from "The LEGO Movie 2: The Second Part"